Happy 3rd Anniversary to Maldives Complete! Three years ago today I pushed the button which loaded the Maldives Complete code and material live to the web. That entire first week, after emailing all my friends, the site got a mere 186 visits and 1,147 page views. 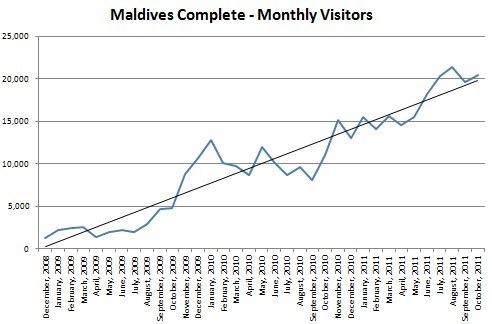 Just yesterday alone, Maldives Complete welcomed over 1,000 visits and delivered over 3,000 page views. It’s come a long way not just in popularity, but in usefulness and comprehensiveness. I’ve extended the ‘Best Of the Maldives’ categories. For example, I broke ‘Geography’ into ‘Location’ and ‘Landscape’. Also, Surfing is emerging as such a prominent activity there, that I have split that out in the Sport section. I also added the Chinese version which has pushed China up the visitor tally to #2 behind the USA. I had my longest research visit ever in July spending 17 packed days ferreting out all sorts of gems to share with readers. The top photographer of the Maldives, Sakis Papadopoulos, has graciously offered the use of his stunning photos on the site which has upgraded the look of the pages where I have been able to incorporate them so far. And there is lots more coming very soon. I have a new ‘Room Type’ database which will have both Profiles and a Finder search capability not just on ‘Resort’, but the Room Types offered (eg. “Jacuzzi Water Villa”, “Deluxe Ocean View”, “Super Deluxe Aqua Villa”). I also have one of my favourite projects of the year, the ‘Snorkel Spotter’. Watch this space. Thanks to everyone who has emailed me such kind words about the site and many times contributed great ideas, updates, material and support. This weekend in the USA is sort of the unofficial starting pistol for the Christmas shopping season. While purists bemoan the creep of holiday decorations, promos and music into the days before Thanksgiving, discretion dictates that one holds off until one has woken from one’s turkey-induced slumber before melting the credit card. 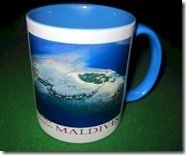 Finding the right gifts is a challenge during Maldive ‘holidays’ as well. One of my pet peeves, as I’ve already written, are resorts that don’t take even more money off me by offering me more enticing mementos and gifts. 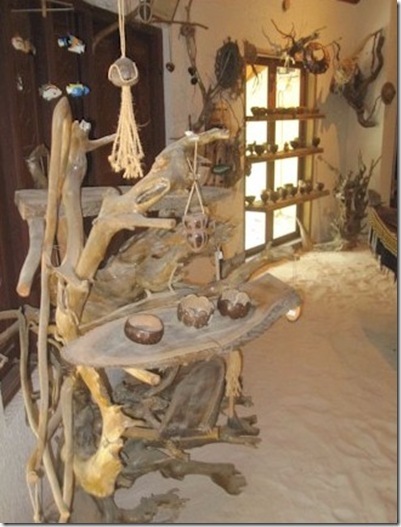 But some resorts do really provide some notable shopping options. In fact, I’ve now broken out a separate ‘Shopping’ tag in the Blog and hence a devoted section in the ‘Best of Maldives’ page featuring the posts so far – Shoe Shopping at Reethi Rah, Dive Centre Shirts at Palm Beach, Wood Craft and Fashion Boutique at Kanuhura, and Largest Shop at Four Seasons Landaa Giraavaru. 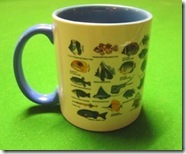 I also have a gift / memento tip – the resort/fish mug. 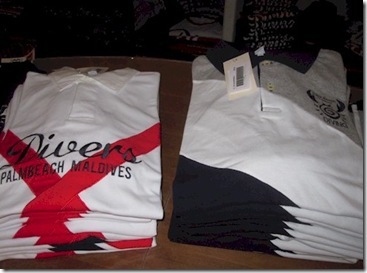 I found the one shown in the pictures above at Vadoo, but I have spotted them at other gift boutiques around the Maldives. The mug is really nicely done. A classic island aerial portrait on one side. I always put the aerial shot of the island I am next visiting as my PC wallpaper to get me geared up for the trip. The aerial views really capture so much of what the Maldives experience is about. Also, it has classic fish spotter chart on the opposite side that we spend so much time pouring over at the end of a day’s diving or snorkelling. Finally, it is finished off with a lovely aquatic blue on the handle and inside. Today is the biggest shopping day of the year in the world It is the biggest shopping day in the biggest consumer economy in the world. ‘Black Friday’ as in dubbed. ‘Black’ as in both ‘in the black’ (like the stores P&L’s expect to be at the end, and ‘black’ as in horrendously frenetic. My wife has a ritual of buying a t-shirt from every dive centre that she has dived from. Some are basic and some are better. As I have previously written, one of my pet peeves is when resorts don’t have nice t-shirts for sale. The pedestrian white shirts with dodgy appliqué graphics of fish just don’t do it for me. Get some decent cotton, a subtle colour and do some subtle styling. That is what the Palm Beach Dive Centre has done. Not surprising with the Italian characteristic flair for style. 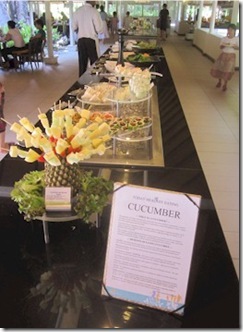 They had the most extensive array of tops we have ever come upon in the Maldives. All with appealing colours. 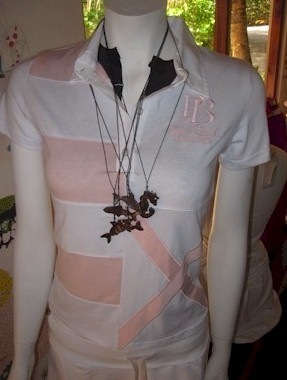 All of the decoration is embroidered tastefully. You may not think of the Maldives for holiday shopping any more than you would think of Target for romance, but this MSNBC report dispels that myth as well. 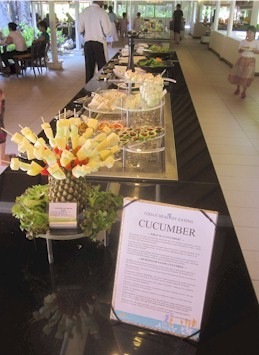 The spirit of the day is appreciation and gratitude (which must come relatively easy for anyone who finds themselves in the Maldives today), but the centrepiece of the American tradition is food. 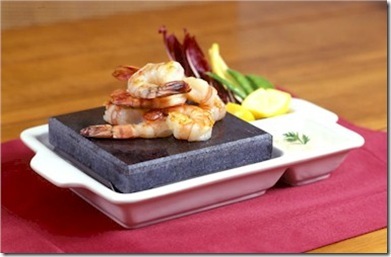 In particular, one main ingredient – turkey. Dubbed ‘Turkey Day’, meals for the next weeks revolves around various poultry combinations from the big bird…leftover turkey, turkey sandwiches, turkey curry, turkey soup, etc. The ‘traditional’ gift for 6th anniversary might be iron, but the USA has adapted a ‘Modern’ version of the anniversary gifts which specifies ‘wood objects’ as the gift of choice. 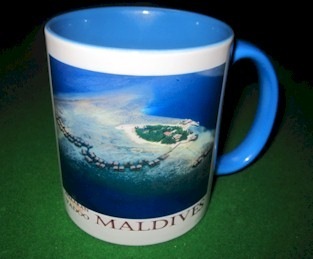 And so if you are looking for an appropriate gift to celebrate this milestone of blogging, then Kanuhura is your first place to check out. 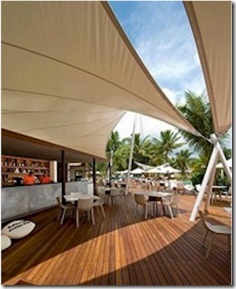 Wood is a thematic element throughout the resort. It extends the overall aesthetic which focuses on Nature. 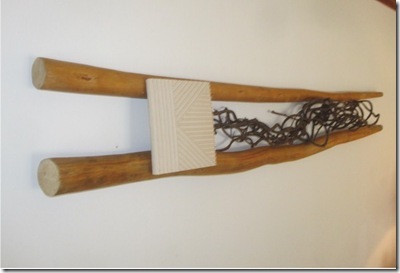 Every room features a wooden piece of wall sculpture (see picture below). My favourite use of wood is the coffee tables in the Handhuvaru Bar which are carved from trees downed by the tsunami which hit the island. 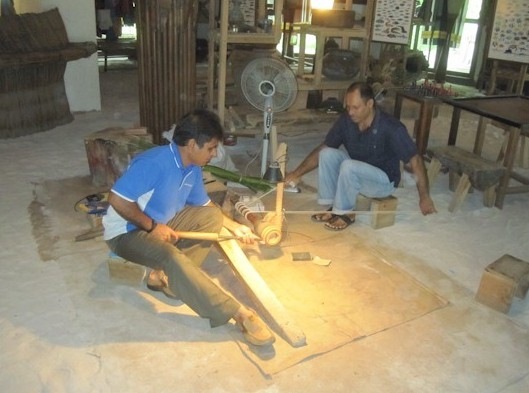 All of the pieces are made at the Haruge Maldivian Cultural Center at the resort using traditional artisan techniques. 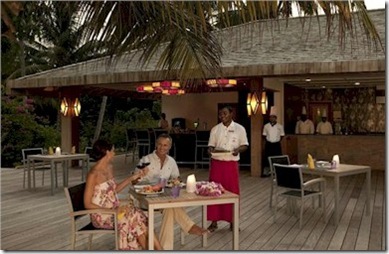 You can watch them working at the centre or during Maldivian Feast nights (cooked by women from local island) and the artisans come out and do demonstrations during the meal. 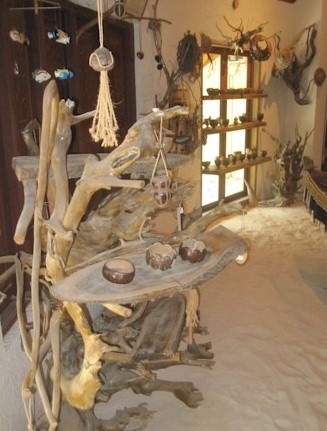 If you want to purchase a bit of Kanuhura to take home with you, then the same artisan workshop that creates all of these pieces also produces various items for sale. 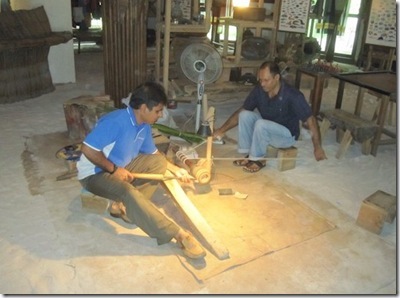 They sell various plates, serving items and other pieces made from Kanuhura wood. This week marks my 6th anniversary of blogging. 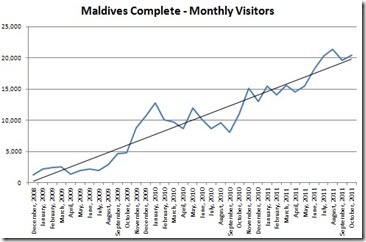 I actually first cut my teeth on digital media a number of years prior to the launch of the Maldives Complete blog. I first started writing about “Leadership and Management / Turning Adversity to Advantage.” The traditional anniversary gift for 6 years is ‘iron’,’ so I guess the best place for me to go to celebrate my 6th anniversary would be somewhere I could get out a few 9-irons to practice my swing (not to mention a timely USA’s win this weekend in the President’s Cup). While Meeru has a conventional driving range (with an adjacent executive course) and Kuredu has 3-par course, Palm Beach has taken the concept ‘out’ a bit. You also might have heard all of those fantastic stories about the proposed floating golf course. 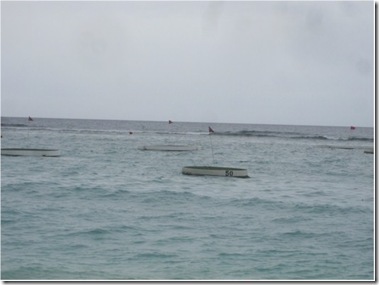 Well, Palm Beach has taken the first steps with a ‘floating driving range’. 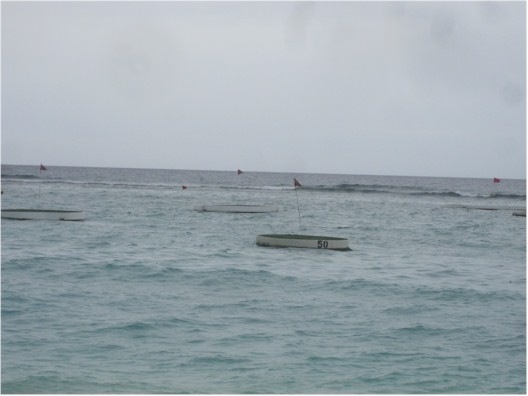 Bobbing mini-greens with flag anchored in the lagoon provide distance markers for a driving cage set up on the shore side. In so doing, Palm Beach has also created the world’s biggest water hazard. Lest you fear that all of those golf balls should prove a hazard of another sort to marine life, actually the balls are specially made of biodegradable material which breaks down into fish food after 48 hours in the water. You can get 10 for $2, or 100 for $8. 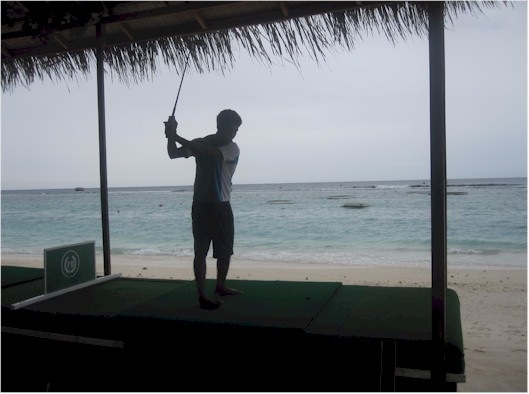 The golf centre also features golf pro Alberto (featured in the picture at top) who will help you on your swing and there are several putting green holes to practice your short game. From proud show of world travel highpoints to an embarrassing show of world travel wannabees. ‘New7Wonders of Nature announcement this week of its 7 ‘winners’ vindicated the Maldives Marketing and Public Relation Corporation’s bold move to withdraw from the suspiciously dodgy campaign. 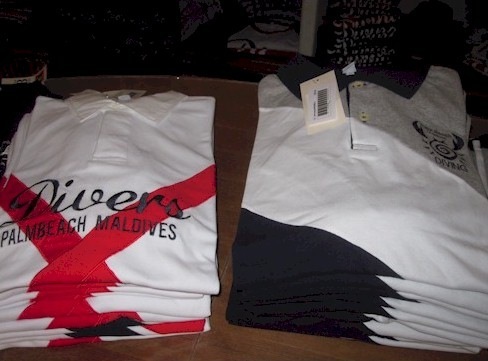 I’m as much up for a good publicity stunt to draw attention in a fun and creative way, but when the New7Wonders group started trying to extort big bucks from participants, its true colours showed and the Maldives wisely withdrew. Now this hokum has run out of time (it had been going on for years) for bilking keen tourism agencies and had to finally come to some conclusion. It was kind of like the TV series Lost that captured the imagination at first, then got tired, and in the end was exposed as an aimless exercise. The end result announced this week was no more satisfying than Lost’s final perplexing and insulting episode. Really, that’s the ‘7 Natural Wonders of the World’? If that’s them, then the Maldives is right to withdraw itself from such weak company. The results reinforce the increasingly evident assessment that the whole campaign was simply a vehicle for the most desperate destinations to try to get some exposure and faux bragging rights. For starters, the Grand Canyon doesn’t even make the list. The Grand Canyon is one of those jaw-dropping, jelly-kneed natural wonders that top everyone’s list who actually know something about the world of travel. Not having the Grand Canyon on the list is like not have the Great Pyramids on the list of Ancient Wonders of the World. I feel sorry for the people who end of going to Iguazu Falls instead of Victoria Falls or Table Mountain instead of Everest. For a more respectable list of 7 Natural Wonders check out – http://sevennaturalwonders.org/the-original.